One of the underlying themes of American ephemera is the rise of the middle class. The overall standard of living began to improve during the industrial revolution, and continued to grow despite periodic obstacles like the great wars and economic downturns. 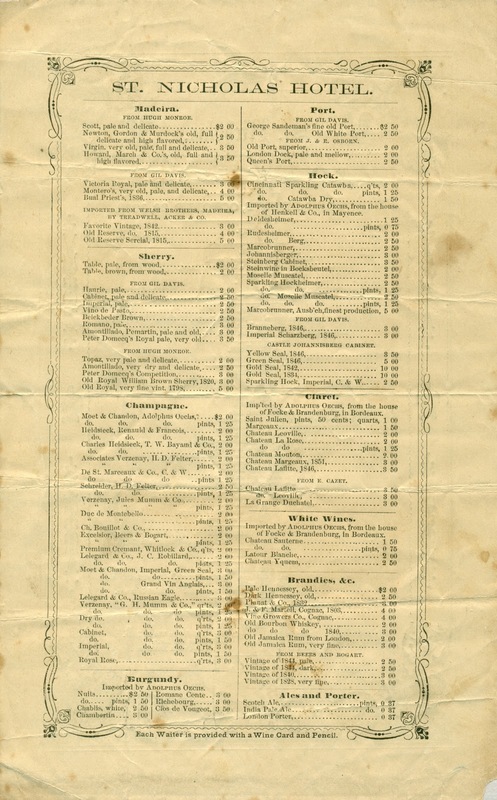 Although it played out differently in various segments of the population, people generally lived better and better over time, as illustrated by a group of antebellum menus from New York City. 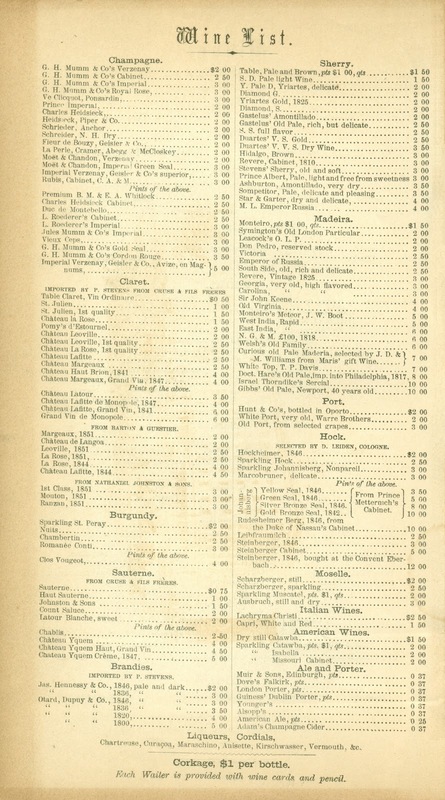 Menus from five luxury hotels reflect the emergence of a sizable upper-middle-class during the twenty-year period just prior to the Civil War. At the time, middle-class families in the New York lived either in a boarding house or a hotel; there were no other options—private houses were prohibitively expensive and apartment buildings were not developed until the late 1870s. Those who prospered could improve their standard of living by moving to a better boarding house, and beyond that, into one of the large hotels that catered to permanent residents. The importance of hotels in urban life cannot be overestimated. “Citizens were known to pass their entire lives in them,” recount historians Michael and Ariane Batterberry. “Families tended toward hotel life. No one but the extremely rich bothered to operate their own households.”3 There were also social advantages to this lifestyle, particularly for married women who were freed from the chores of domestic labor. 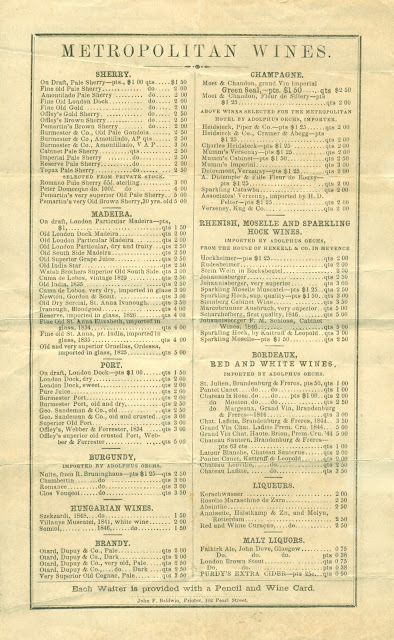 When asked to define the nature of Americans, poet Walt Whitman replied, “They are a boarding people.” Menus from the period show how well some of the boarding people lived. 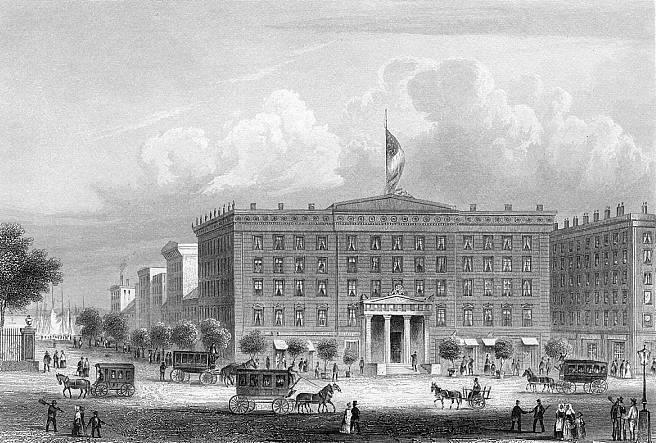 In the early 1830s, John Jacob Astor, the wealthiest man in the United States, hired architect Isaiah Rogers to design a hotel for New York that would rival Boston’s Tremont House—a hotel that Rogers designed several years earlier. 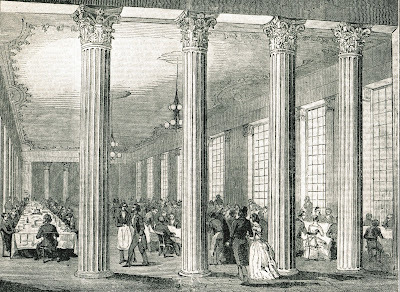 The need for a new luxury hotel became evident as the city’s wealth increased after the completion of the Erie Canal in 1825. With fewer than thirty hotels in the city, there was also a growing demand for high-end housing. Before the six-story building was completed, editor Horace Greeley informed his readers that half of the rooms had already been reserved for family residence. In June 1836, the Astor House opened at 255 Broadway, between Vesey and Barclay Streets, across from the old Federal Building. The timing was poor for the country was just beginning to experience a series of financial panics that would culminate in a six-year depression, one of the worst in the nation’s history. 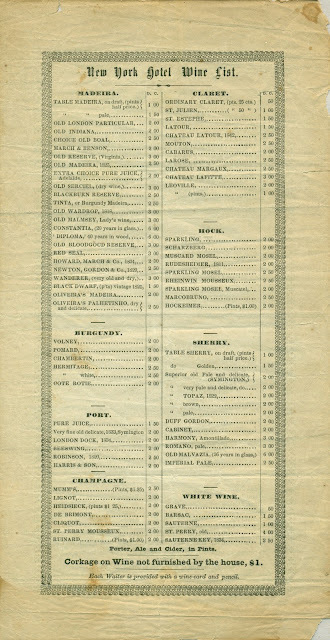 The lavish table d’hote menu shown below, dated September 9, 1841, does not indicate that the country was still in the lingering grips of an economic decline.4 Despite its refined French cuisine, the Astor House operated on the American plan where the daily rate included room and board—about $2.50 a day for transient guests in 1841.5 This menu is for the “gentlemen’s ordinary,” meaning that it accompanied the set meal served in the men’s dining room. 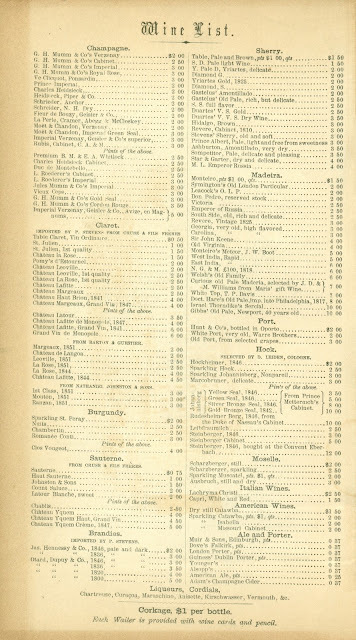 A popular gathering spot for the city’s merchants, the Astor House operated several dining rooms, including a “ladies ordinary,” a separate dining room for unescorted women. This practice was then customary at the upper-class establishments. Despite being the first to offer hall baths, the New York Hotel reportedly got off to a slow start when it opened in 1844, perhaps due its remote uptown location at 721 Broadway, between Washington Place and Waverly Place. Another problem was that it initially used the European plan, charging separately for room and board. This decision was made by the hotel’s manager, a French chef named S. B. Monnot who wanted to give his guests more flexibility. 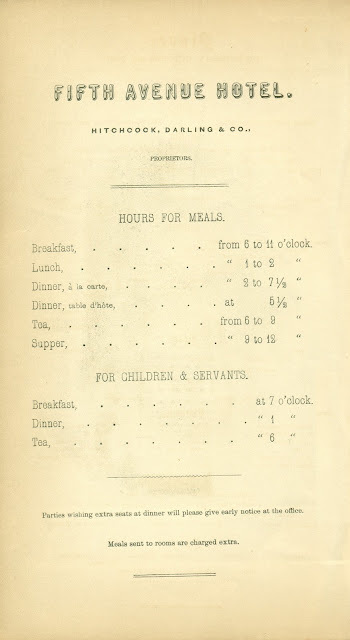 At the time, most Americans still preferred the sociability of being served communally at set hours. Transient guests looked forward to the company of interesting dining companions when they visited the city. In fact, this hotel eventually became a favorite of aristocratic Southerners. Moreover, the custom of eating at a set hour fit into the domestic routine of the families living at the hotel. 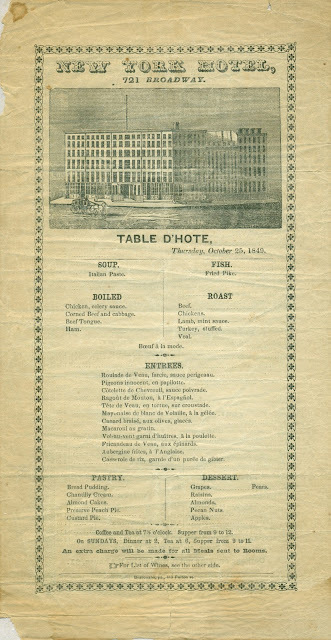 The table d’hote was the main pillar of family life in a hotel, according to Harper’s Weekly. 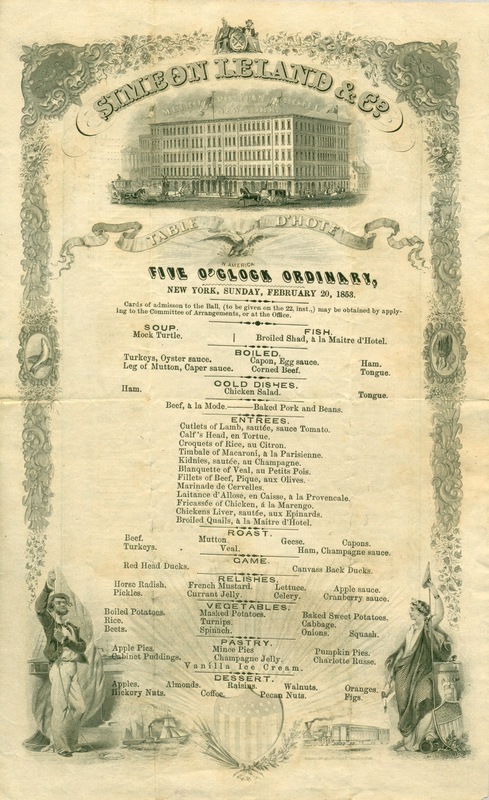 As shown below, the New York Hotel had adopted the American plan by 1849. 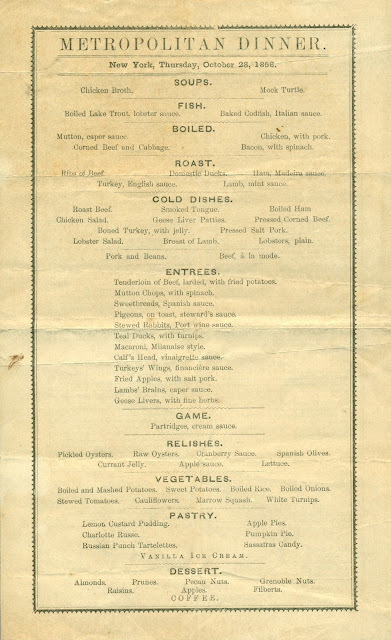 The supper menu below from the Metropolitan is dated Sunday, February 20, 1853. 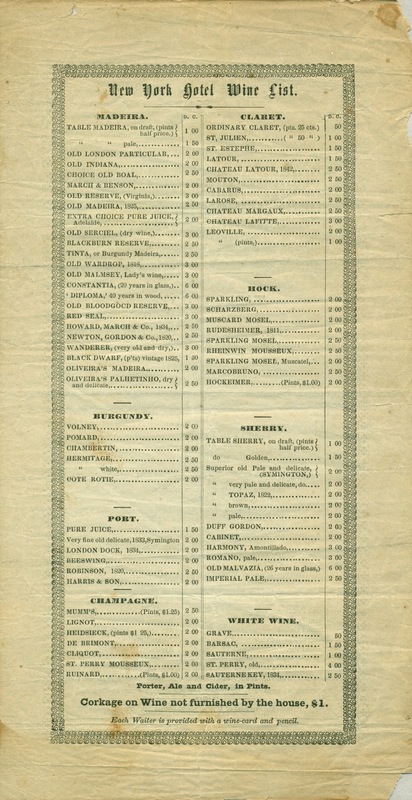 The bill of fare is not evenly positioned within the engraved border and lacks the name of a printer, indicating that it may have been printed at the hotel. The social swirl is evidenced by the notice advertising the Tuesday night ball. There were also many theaters nearby, such as Niblo’s Garden which was nestled in the crook of this L-shaped hotel. 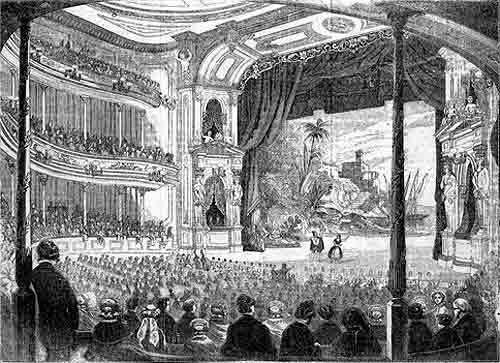 In fact, the buildings were so close that the theater’s saloon was converted into a hotel dining room in 1865. Niblo’s Garden featured vaudeville, plays, and operas—Donizetti’s comic opera Don Pasquale was performed during the week of this dinner. Two menus below, from the Metropolitan and St. Nicholas Hotels respectively, appeared on consecutive days in October 1858. 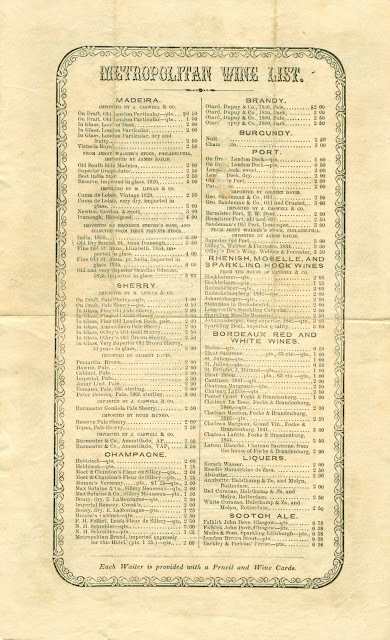 The one from the Metropolitan is entirely in English, without any of the culinary French liberally employed on the hotel’s menu five years earlier. 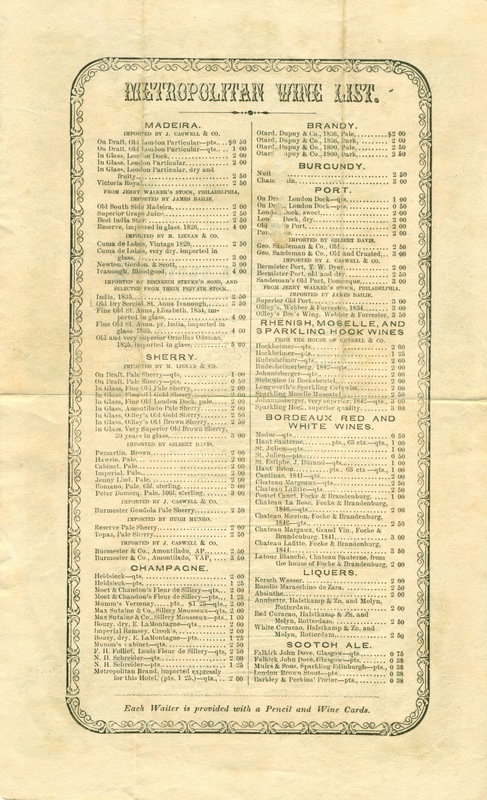 As indicated by the name of the printer on the back, some firms began to specialize in printing daily menus at around this time, when the number of hotels and restaurants in the city expanded. 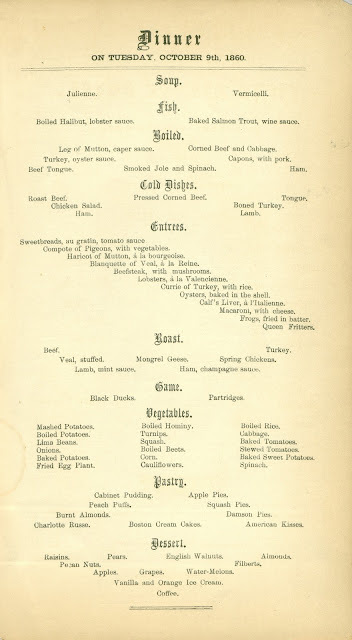 Situated among the entrees on this menu from the St. Nicholas, robin au crouton was prepared by broiling the small birds and serving them on toast in the same way as thrushes or quail. 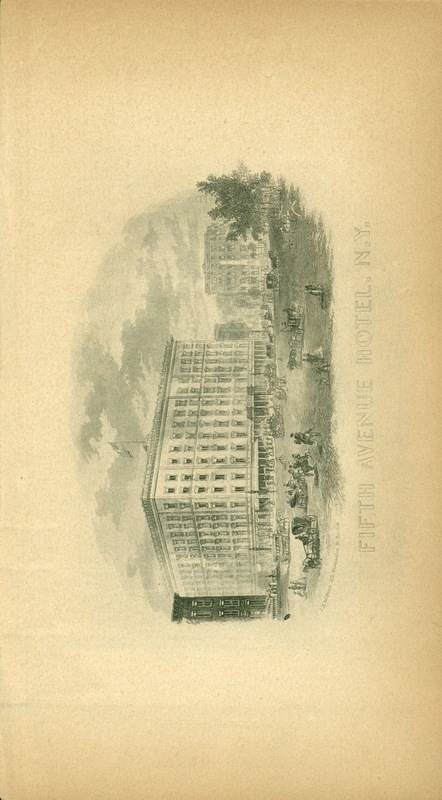 In 1859, the Fifth Avenue Hotel opened far uptown where Fifth Avenue crosses Broadway at 23rd Street. 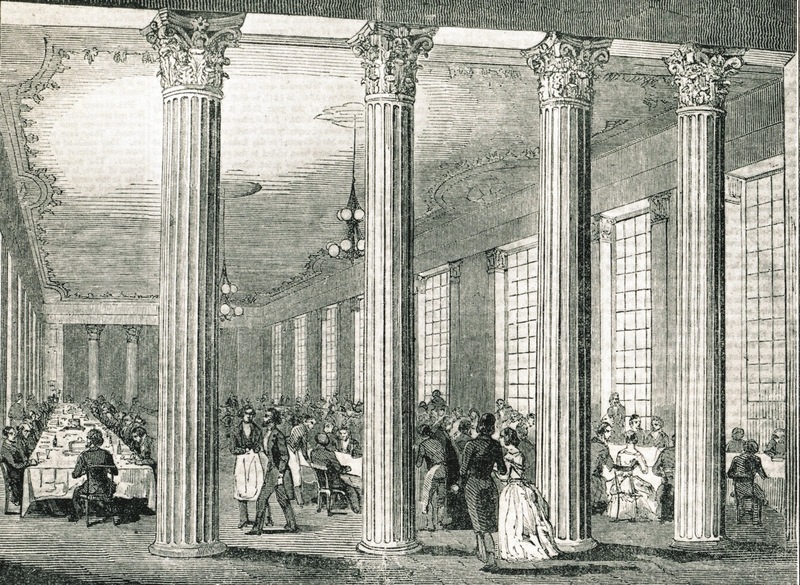 The white marble-faced building, opposite Madison Square Park, featured richly appointed public rooms and lavish décor. Unquestionably the finest hotel in New York, it employed four hundred servants for its guests and was the first hotel to offer private bathrooms. 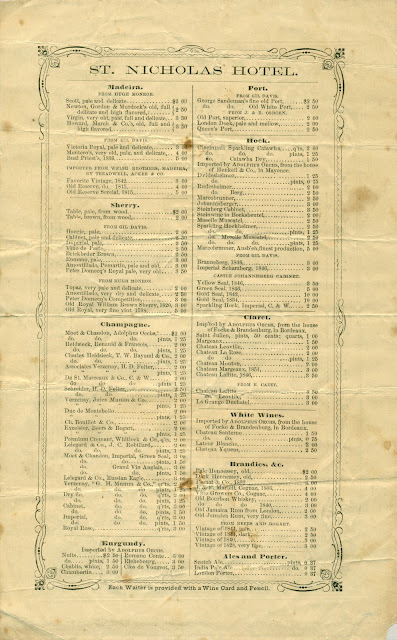 Another innovation was its passenger elevator, called a “vertical screw railway.” This table d’hote dinner menu is dated October 9, 1860, about a year after the hotel opened. 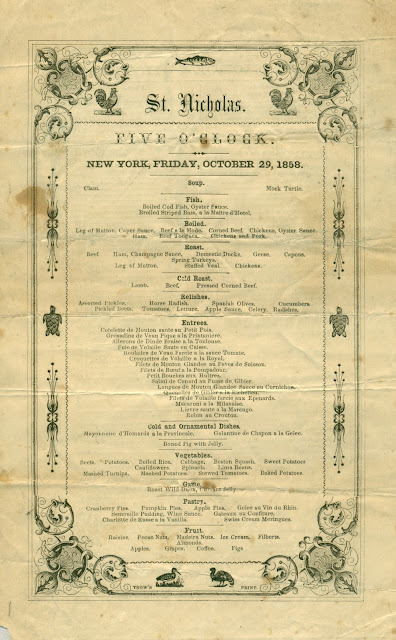 Two days after this dinner, the Prince of Wales, nineteen-year-old son of Queen Victoria and heir apparent to the British throne, arrived in New York for a visit. Two hundred thousand people jammed the streets to catch a glimpse of the young prince as his carriage proceeded up Broadway. Never ones to miss an opportunity, the management of the St. Nicholas and Metropolitan Hotels sold their rooms facing the street for “fabulous prices” to anyone willing to pay for a good view of the parade, according to the New York Times. The prince and his entourage continued all the way up to the new hotel, where they stayed for several days, but that is another story. 1. Harper’s magazine, January 2010. 2. Depressions in the U.S. occurred after economic contractions in 1818-1819, 1836-1837, 1856-1857, 1872-1873, 1884-1885, 1892-1893, 1920-1921, 1929-1933, and 1937-1938. Growth slowed in a series of post-World War II recessions in 1954-1955, 1957-1958, 1960-1961, 1969-1970, 1974-1975, 1980-1982, 1990-1992, 2001-2002 and 2007-2009. Paul S. Boyer, Oxford Companion to United States History, New York, 2001. 3. Michael and Ariane Batterberry, On the Town in New York, New York, 1973. 4. 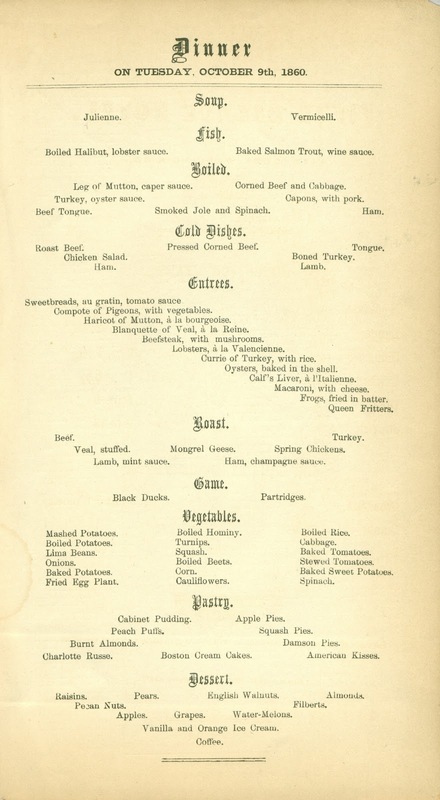 It is interesting to note that psychologist William James was born at the Astor House on January 11, 1842, four months after this dinner. 5. A. K. Sandoval-Strausz, Hotel: An American History, Yale University Press, 2007. 6. Lloyd Morris, Incredible New York, New York, 1951. One of the most helpful blog posts I have read, and the menus are absolutely fascinating. In trying to understand NYC restaurant culture before the Civil War, I deliberately sought out your blog--and I am so glad I did. Thanks for your information, speculations, and such clear copies of the menus!